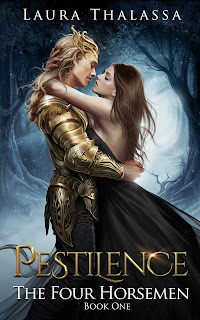 The Official Website of Laura Thalassa: Pestilence (The Four Horsemen #1) is Now Out! It's ALIIIIIVE! I'm so freaking pumped to announce that Pestilence, the first book in my Four Horsemen series, is now out! You can find it here! This is a new adult post-apocalyptic romance that stars one of the four horsemen of the apocalypse (eep!) and the girl that was (un)fortunate enough to meet him! I'll be sharing the playlist with you all super soon, and I'll be doing a Facebook Live video in another week or so to answer all things Pestilence related (and some things not Pestilence related). If you want to see it, make sure to check in on my Facebook page (which you can find right here). Some quick extras: Yes, there will be print books of Pestilence. They should be ready to go by the end of this week if not sooner! Yes, there will also be an audiobook of Pestilence. It will take a couple of months to produce, so expect it to release mid May! Lastly, yes, I'm resuming work on Dark Harmony (for those of you interested in hearing updates on my Bargainer series), and this final book in The Bargainer series should be out this summer! For those of you who want to read the description of Pestilence, you can check it out below!